Nelson is New Zealand’s place in the sun, where apples and hops ripen, and scallops are dredged from Tasman Bay. A famed holiday destination, it offers orchards, beaches, three national parks and a thriving arts and crafts community. Nelson is the largest city in the northern South Island, and is also the name of the region to its south and west. 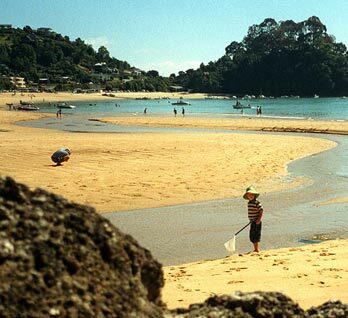 Visitors enjoy its sunny weather, beaches, mountains and three national parks (Abel Tasman, Kahurangi and Nelson Lakes). Nelson’s coast is dominated by two huge, shallow bays – Tasman Bay and Golden Bay. Inland the region is hilly or mountainous, with areas of limestone and marble which include deep caves and sinkholes. Farewell Spit is New Zealand’s longest sandspit. Because north-west Nelson’s mountains were less heavily glaciated than mountains further south during recent ice ages, they acted as a refuge for plants and animals. Very diverse species live there, including Powelliphanta snails, whio (blue ducks), bats and New Zealand’s largest native spider. Many of Nelson’s lowland forests were cleared by Pākehā for farming. Since the 1300s Māori have lived in the northern South Island, which they call Te Tau Ihu (the prow) of Māui’s canoe. Over time, a series of tribes arrived and ousted the people who were already there. Today the region has eight tribes: Ngāti Kuia, Ngāti Apa, Rangitāne, Ngāti Toa, Ngāti Koata, Ngāti Rārua, Ngāti Tama and Te Āti Awa. The first meeting between Māori and Europeans was in Golden Bay in 1642, when four members of Dutch explorer Abel Tasman’s crew were killed by Māori. In 1827 French explorer Dumont d’Urville visited Tasman Bay. European sealers, whalers and traders arrived in the 1820s. Nelson was the second New Zealand Company settlement, and was established in 1842. Most settlers were British, but some Germans also arrived. There was limited flat land for farming, and some settlers began to survey the Wairau Plains. However, Ngāti Toa chief Te Rauparaha believed that these had not been bought, and in June 1843 a fight broke out. At least 22 Pākehā and four Māori were killed. Nelson has always been sparsely populated, although coastal settlements grew from the 1990s. From the 1970s alternative lifestylers (‘hippies’) were drawn to the cheap, beautiful land in rural areas. Some set up communes. Farming was hard to establish because the region was isolated and hilly. People farmed sheep and beef cattle, and there was dairy farming in Golden Bay. Hops (which are used to flavour beer) were first grown in Nelson in 1842, and are still produced today. Tobacco was grown from the mid-19th century, and in 1933 about 90% of New Zealand’s tobacco came from Nelson. However, growers changed to other crops after their legal protection was removed in the 1980s. Apples and other fruit were grown from the 1840s. From the late 20th century there was an increasing number of vineyards and wineries. In the 1850s gold was found and mined in western Golden Bay, giving the bay its name. New Zealand’s first coal was mined at Whanganui Inlet in 1840, and later at Pākawau and Pūponga. Ochre deposits (used by Māori to decorate carvings and bodies) were mined and made into iron or paint. Marble from Tākaka hill was used in Wellington’s Parliament buildings. In the 2010s the region had two electorates – Nelson, which covered Nelson city and its surrounds; and West Coast–Tasman, covering the rest of the region. Nelson was part of Te Tai Tonga Māori electorate. Nelson is home to many artists and craftspeople. Painter Toss Woollaston lived in the region for many years; other artists who spent time there included Colin McCahon, Rita Angus and Doris Lusk. The World of WearableArt show began in Nelson in 1987. New Zealand’s first rugby game was played in Nelson in 1870. The area offers good trout fishing and hunting. People enjoy tramping in the national parks, caving at Mt Arthur and Mt Owen, and swimming and sea kayaking along the coast of Abel Tasman National Park.